Little River at the Sinks. This isn’t a hard place place to cast or wade, but the fish are challenging to locate and catch. Cast to likely places and then move on quickly. The best fishing is between late March and late October. Winding through the Great Smoky Mountains near Townsend, TN, the Little River is a wonderful destination for all fly fishing enthusiasts. This popular section runs from the stunning Sinks area back into Townsend with pull-offs along one side of the river. It’s best to drive straight to the Sinks, rig up, and work back down river for easy access to wading opportunities. Great Smoky Mountains National Park stopped their trout stocking program decades ago, so all fish are wild and tricky to catch. With dramatic scenery, you’ll mainly target wild rainbows, browns, and maybe catch brook trout near feeder streams. The river offers hundreds of unique pools, riffles and undercut banks to chase these wily fish. Because of that, stealth is the key to success on the Little River. Keep a low profile, cast smaller flies, and watch where the sun is casting your shadow. As you enter the Park through Townsend, you’ll notice that most of the pull offs are on the other side of the road. Keep driving up Lamar Alexander Parkway until you turn left at the fork. The Sinks parking area will be on your right. After checking this spot out, rig your rods, don your wading gear, and start driving back to Townsend to efficiently use the pull-offs. The prime season to fish is from mid-March until the end of October when the trout are taking dry flies, but you can take trout with streamers, nymphs and squirmy wormies year-round. Blue Wing Olive imitations are a favorite in the spring while yellow sallies become a favorite through the end of summer and early fall. During late October through November, local anglers will take very large brown trout that cruise shallow pools and runs. These fish are extra spooky and are typically targeted with small nymphs under small indicators. If you only have a half day to fish in the Smokies, this is the spot you can’t miss. Anglers from all over the world have traveled to fish this river for decades, so it’s certainly a bucket list destination for the dedicated angler. 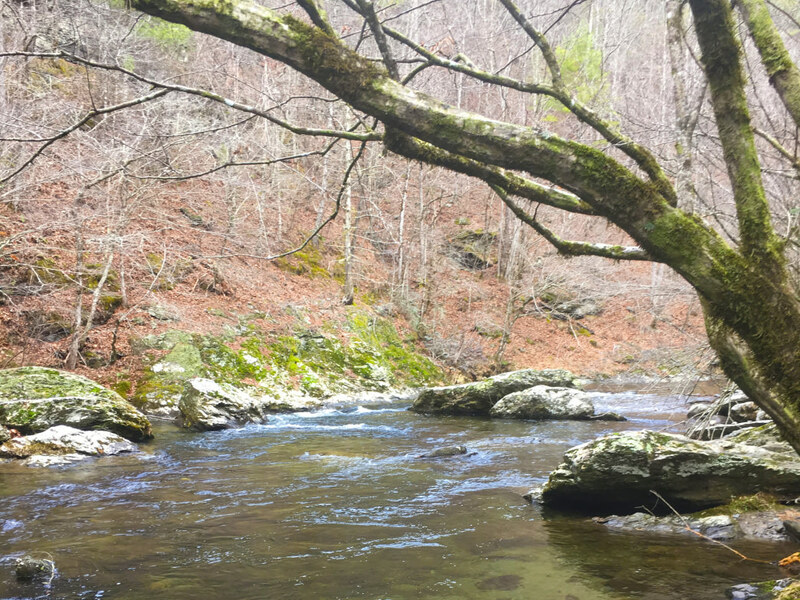 That being said, the Little River will definitely test your skills, and you will likely see more anglers on the river than the hike-in streams or smaller tributaries. If you’re looking for native brook trout, solitude, or more aggressive fish, you may want to try a smaller stream. Even though you’ll be in and out of your car, this is a physical fishing experience. Many of the best spots are protected by dense vegetation and boulders, so a little rock scrambling and creative casts will be needed to get the best presentation of your fly. From Knoxville: Drive through Townsend into the Park. Take a left towards Gatlinburg and drive until you see “The Sinks” parking area. All anglers must have a Tennessee or North Carolina fishing license with a trout stamp. Artificial bait only and no double or treble hooks.